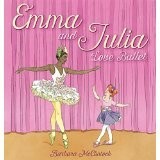 Ballet is the star of this story so beautifully done by award winning-illustrator Barbara McClintock. Emma is a little girl who lives in the country and takes ballet lessons. Julia is a grown-up ballerina. The story is beautifully told in parallel fashion as we see each girl get breakfast and go through their day. Besides the comparison between how they do things because of their age, is the comparison of rural versus city life. It is a fascinating dance within the story itself. The diversity factor also plays in this story as Julia is of African American descent, reflecting the realities of our current prima-ballerina in the United States. A marvelous conclusion to the story has Emma asking for Julia’s autograph with Julia answering, how she once shared Emma’s dream of becoming a ballerina. So this is a different kind of circle story. Where the mouse ends up wanting another cookie, in this instance, the book clearly tells little girls who love ballet their dream can be realized. Stretches and poses were carefully studied thus beautifully illustrated. Current and former ballet students will recognize the positions. Other types of dances are also represented and encouraged. This book is a delight and should be part of every school and public library. Teachers will fulfill many core curriculum standards in literacy such as picture clues, sequencing, comparing and contrasting, as well as, main idea. An all-around winner! Poetic and rhyming, this new book highlights the life cycle of the lowly bean. A hoe to help grow. And a curlicue catching dew. Oh no! Wind roars. Rain pours. 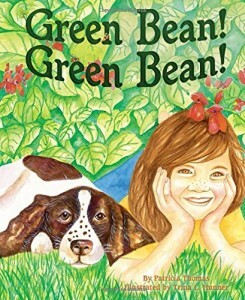 A young girl plants beans, with the help of her dog. As the garden grows, the girl discovers all the aids and perils for her burgeoning plants. Beetles and snails chew on the leaves. Moisture, hoeing, and stakes help the plants grow. A rabbit comes for a snack, but is thwarted by netting. Patience and sharing with birds and bees bring forth a bountiful harvest. And rejected beans make sure the cycle begin again. Wonderful, lively illustrations accompany this sweet story. This is a great companion for a first or second grade unit about the life cycle and could easily include kids sprouting their own beans, potatoes, or avocadoes. Some of the activities even encourage eating the beans and other fruits and vegetables! Title: Green Bean! Green Bean! How many shades of white do you see around you? 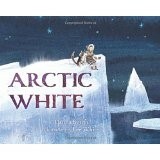 Danna Smith introduces the nuances of white in the beauty of the arctic using short melodic sentences. Lee White does an exquisite job of illustrating various whites amid classic winter blue hues. But grandfather has a secret about something extra special he can only show the children in the darkest dark. He leads them out on an adventure. What might it be? Something sure to delight every reader. The double-paged spread depicting the Northern Lights is glorious. But the story doesn’t end yet. The children hurry home to recreate marvelous full color pictures to display inside their igloo. The double meaning of colors existing on the inside, will intrigue adults and children alike. It could lead to interesting discussions. While this book easily fulfills core curriculum standards in literacy, geography and science; the art teacher might get the most mileage from it. Surely the children can produce wonderful colors from any part of the world to decorate their winter hallways. Hidden pictures add to the excitement of this new book by the creators of, Snowmen at Night. 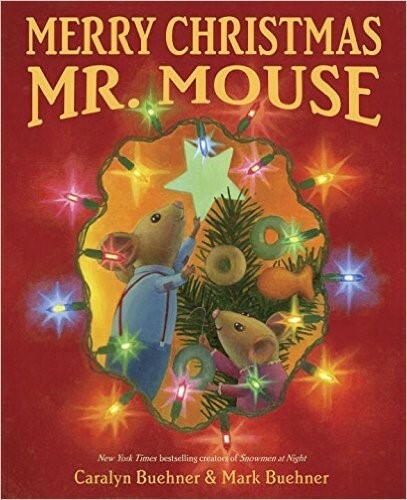 This rhyming story tells of a mouse family that moves into a nook under a kitchen floor. Their first discovery is special cooking and decorating done by the people of the house. Without missing a beat, Mr. Mouse hurries back to the nook and begins the same party preparations for his own family. Grade one and grade two readers will enjoy reading this story on their own. Preschool listeners will be awed by the bright colored multi-layered illustrations. There are even hidden pictures on every page, with answers provided on the backside of the cover. What a neat idea! Everyone will enjoy recognizing the everyday items carried into the nook by the mice to be used for their own furniture, clothing and snacks. Perhaps a discussion will follow about other household items to see how they could be used by others. What an interesting look at spatial relationships to see Mrs. Mouse using a birthday candle as a living room reading lamp. 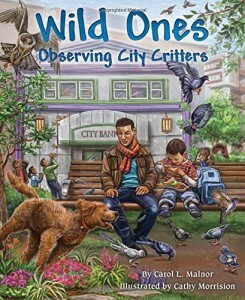 Librarians, teachers, and parents should put this on the purchasing list right away. Literacy skills will be met in the core curriculum standards in multiple areas. Picture clues, rhyming words, predicting outcomes, and cause and effect, are just examples of the skill practice possible. Extras: Hidden pictures in the illustrations. 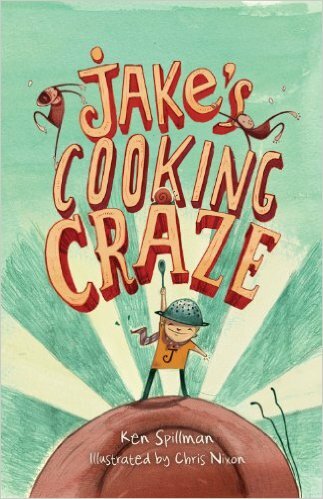 Encouraging kids to try something new, this book is the story of a budding chef. Jake is not a devotee of a popular cooking show until he hears what he could reap from being his own cook. Jake starts watching JuniorChef partly because everyone else does. It inspires him to make a less than stellar recipe of his own – sweet potatoes and beans covered with all the condiments in the refrigerator. Dad decides it’s time for Jake to learn from Nana. But Nana’s lessons are boring for Jake. As part of the cooking show craze, Jake’s school is to participate in a competition. So Jake gets really creative – with snails from his garden. Hilarity ensues, complete with kid-pleasing bodily functions. Humorous illustrations are scattered throughout the text. Second graders will learn about some pretty fancy dishes as they practice their literacy skills. Jake may not be able to understand the various meanings of “rare,” but maybe the readers can. Claude and Sir Bobblysock are at it again. As soon as Mr. and Mrs. Shinyshoes leave for the day, the pals are off in search of adventure. This time, they wander into a kids’ dance class. When a fly goes up Claude’s stylish red sweater, his gyrations are the hit of the class. Claude and Sir Bobblysock then follow the kids to a theater, where they are all to participate in a variety show. There, of course, Claude saves the day. A bad man tries to scare everyone away by pretending to be a ghost, so he can have the prize. But Claude recognizes his fakery. An operatic lady Viking, whose talent is breaking glass with her voice, causes a large chandelier to nearly fall on the show’s sponsor. Claude and the bad man catch the chandelier in time. So Claude and Sir Bobblysock take home boxes of cakes, the prize. Mr. and Mrs. Shinyshoes are very confused by the cakes. Much of the story is told through the amusing illustrations, especially the contributions of Sir Bobblysock. There is a lot to hold the attention of second graders. 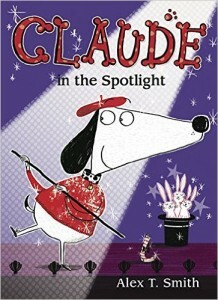 This would also make a great read aloud, with kids helping to point out the many illustration details. Leaves change color and fall breezily to the ground every year. Children love to catch them, collect them and figure them out. 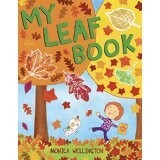 Monica Wellington’s new book helps them identify leaves and put them in a book of their own making. While this book is fiction because the little girl is not real, Wellington has included a great deal of authentic science. Her depiction of various leaf types is well done and the leaves are matched with the names of the trees from which they come. Grade one, grade two, and even grade three readers will be able to use the book for basic leaf identification. However, the scientific notes placed in text boxes on the pages illustrating true leaves are done in tiny print that will require adult help for some children to read and decipher. Librarians and teachers can use this book successfully as a read aloud for pre-school through first grades. While the book meets core curriculum standards for literacy in the areas of picture clues, comparing and contrasting, separating fact from fiction, it also fulfills standards for natural science in the elementary grades. This book deserves a second look as first glance will sell it short of its educational value. 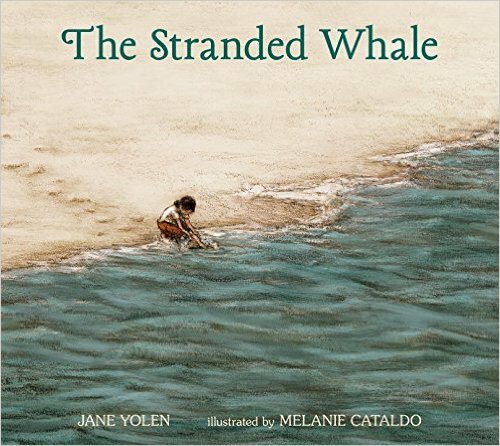 In this beautiful, short tale of a beached whale and how three children tried to save it, Yolen relates a timeless struggle against the harshness of nature. As the children walk home from school, they discover a whale stranded on the beach as the tide goes out. They immediately start trying to wet the whale’s skin with their sweaters and call for help from the beach’s emergency phone. Many people come to help, but it’s not enough. Eventually, the whale dies and the kids go home to their frantic parents. The Coast Guard gives the children each a medal for making the attempt to help, but what they really want is for the whale to be alive and well. Cataldo’s lovely illustrations evoke the feel of the ocean and are dark enough to convey the seriousness of the situation. 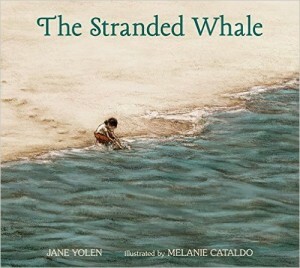 In the Author’s Note, Yolen explains her road to this story and the history of beached whales. She notes that this phenomenon doesn’t affect the overall whale population. Animals die. Second graders will enjoy reading this story independently and should find hope in the circle of life. Nature may be harsh at times, but it is what it is. And people can always help. With recent challenges to voting rights by some states, it’s important to keep in mind the history of civil rights struggles. The Founding Fathers only guaranteed voting rights for white male landowners over 21. Slowly, the barriers have come down, but not without challenges. In the 1950s, many states were forced to allow blacks to vote, but many found a way around that by making requirements such as the so-called literacy test. Poll judges were allowed to randomly (meaning for blacks only) present potential voters with complicated texts and require them to interpret the text. In this beautifully and vividly illustrated picture book, the authors tell of a black farmer trying to vote for the first time. When he is turned away, his grandson understands the fervent hope of his granddaddy and vows to vote in his granddaddy’s place one day. 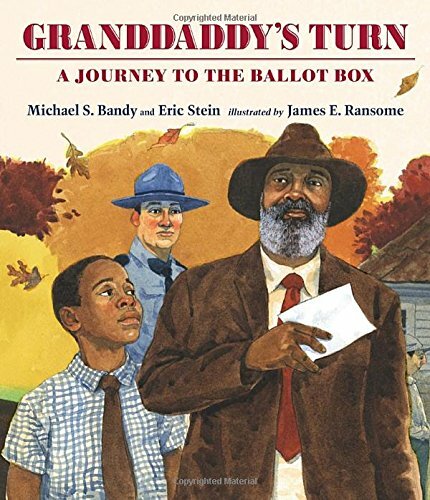 With references to the hard work granddaddy does and the loving guidance Granddaddy provides, the reader can identify with the characters and sense the importance of the vote. The tears Granddaddy sheds at being denied his rights is a great touch. Second grade readers will learn a lot about civil rights history and citizenship. Although this is fiction, it could be anyone’s story.